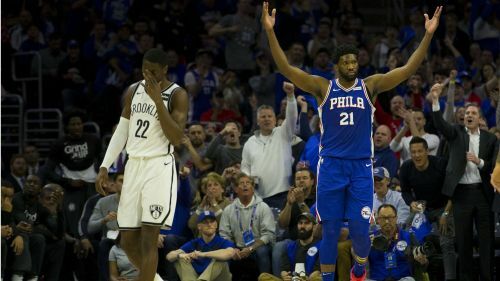 The Philadelphia 76ers tied the NBA playoff record for most points ever scored in a quarter as they blitzed the Brooklyn Nets in Game 2 of their Eastern Conference first-round clash. Philadelphia posted 51 points in a stunning third quarter of Monday's 145-123 win over the Nets – equalling a postseason record. It tied the record for most points ever tallied in a single quarter in playoff history, while it is also the highest-scoring third quarter by a single team ever in the postseasons. Joel Embiid's 23 points led the 76ers, who set a franchise record for points in a playoff game – eclipsing the previous mark of 141 against San Francisco in 1967. Ben Simmons finished with a triple-double, tallying 18 points, 12 assists and 10 rebounds as the 76ers levelled the series at 1-1.